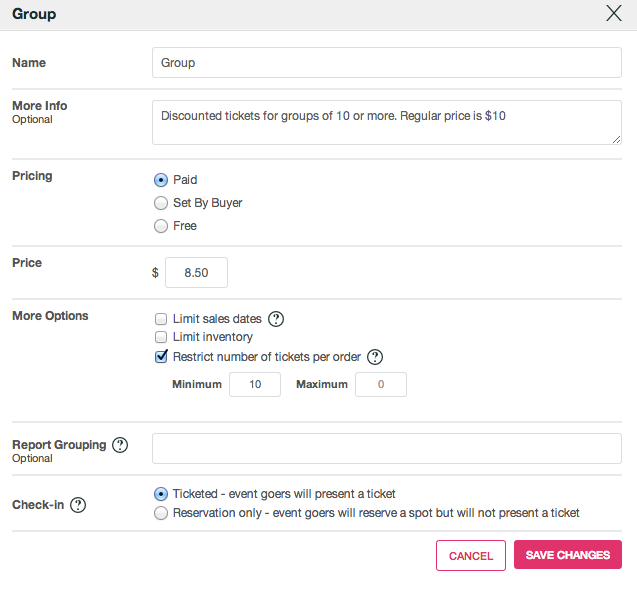 You can create a group discount by adding a ticket type. If you have already created an event, follow these steps. First click the Details tab on the Event Home and then click Add A Ticket. After clicking Add A Ticket, you can edit the group ticket type information in a new window. Name: name your Group ticket type. I named it "Group"
Pricing: set your ticket price at Paid. More Options: limit sales dates, limit inventory (the amount of tickets you want to sell) and restrict the number of tickets that a patron can purchase per order. Set the Minimum at the number of tickets a group discount becomes available. In my case 10 = a group. Report Grouping: This optional field can be used for any purpose you desire.